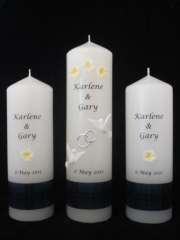 Our clients asked us to design a unity candle set which expressed their Cook Island and Scottish heritage. We knew the bride was planning to carry a beautiful bouquet of frangipani flowers and the groom was going to wear his kilt. With delicate white wax frangipani prepared and painted with a yellow centre, it was the relatively dark kilt pattern which created a challenge. Various sample mock-ups were prepared, including the pattern cut in matching wax colours, and a fabric sample photographed. Finally a graphic pattern of the tartan was applied in print format to all candles, including the tapers. The main candle was finished off with printed names of the couple and the wedding date, as well as the popular doves and entwined rings in silver. The main candle measures 250x65mm and the side candles 150x65mm. The candles were presented in three separate gift boxes, for the side candles to be gifted to family. Click here to view Karlene & Gary's wedding photo. Studio photography against the dark background unfortunately darkened the tartan band further. Please don't hesitate to discuss your own ideas and requirements.